Dimensions: 5 1/4" x 8"
REVISED AND EXPANDED for the fourth edition. Designed to give the reader insight into the basic functions of the human mind and how knowledge of these functions (and their interrelations) can enable one to use one's intellect and emotions more effectively. 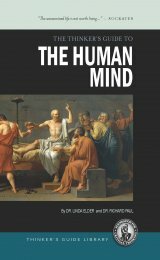 Why a Mini- Guide on The Human Mind? To live as a reasonable and ethical person is to live well. Yet humans are not by nature rational or ethical. Humans are predisposed to operate in the world in narrow terms of how it can serve them. Their brains are directly wired into their own pleasure and pain, not that of others. They do not inherently consider the rights and needs of others. 1. Understanding how the mind works. 2. Using this understanding to develop skills and insights. This guide addresses the first of these requirements. It lays the conceptual foundations necessary for understanding the mind, its functions, its natural propensity toward irrationality, and its capacity for rationality. It is designed for those interested in developing their potential to be fair-minded reasonable persons, concerned with how their behavior affects the lives of others, concerned to develop their full humanity, concerned with making the world a more civilized and just place. It is designed for those willing to transform their thinking to improve their decisions, the quality of their lives, the quality of their interpersonal relationships, and their vision of the world. It is intended to provide an initial map to help interested persons begin the process of freeing themselves from the traps their minds have constructed.